Postage is FREE for UK mainland and Northern Ireland deliveries on orders over £500 (ex VAT). For full details of all delivery charges (including deliveries to the Republic of Ireland, Channel Islands, Isle of Man, etc. ), please see the "Terms & Conditions" page. - solid: e.g. "s. silver" = "solid silver"
- cool: e.g. "c. blue" = "cool blue"
- glitter: e.g. "t. blue G" = "transparent blue Glitter"
We try to show product colours as accurately as possible, but please be aware that there may be slight differences in colour between the online images and the actual boxes themselves. - All other boxes come with lids the same colour as the box. 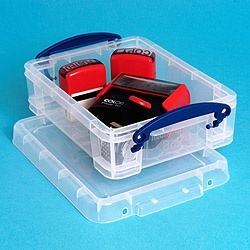 For external box dimensions we use the maximum size of the box with the lid and handles in place. For internal box dimensions, we take the minimum dimensions. All dimensions are approximate. Racking, drawer units, and storage units come with boxes included in the price - please check the individual product pages for details of which boxes are included. Racking and drawer units can also be bought without boxes. - flat top: "flat top"
- stationery tray top: "st. tray top" = "stationery tray top"